For Greece, aquaculture has been recognized as one of the main activities that can contribute to the economic recovery and create a solid base for growth in the coming years. 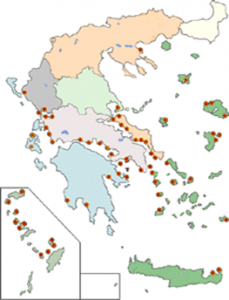 Aquaculture in Greece is dominated by marine fish. The mussel culture is fragmented and based on family-run small units. There is a limited production of freshwater species (eels etc.) and a traditional activity of extensive aquaculture in lagoons. Recently, the algae culture is getting attention as depicted by the establishment of few production units of Spirulina and Ulva. The marine aquaculture industry today is represented by 65 companies with 328 farms while the total marine area occupied is ~78 Km2. The invested capital in the sector amounts to 740 million €, 10,000 people are directly employed and 8,000 indirectly. The marine aquaculture production was 144,000 tons in 2013 (mainly gilthead sea bream and European sea bass but also emerging species like the meagre). The annual turnover amounted to 700 million € (0,38 % of GDP), half of it corresponding to exports. Fish from aquaculture is the second exportable Greek product after fruit and vegetables in the food industry, which in turn make up about 1/3 of Greek exports. In a recently adopted “Position Paper” of the sector the production target for 2030 is set to 350,000 tones. The Greek marine aquaculture represent 63% of the EU and 36% of the Mediterranean production of gilthead sea bream and European sea bass. Current climate change predictions do not show significant effects on Mediterranean aquaculture in short term but within the next decades more noticeable effects are expected due to the rise of the average water temperature. This may result in faster growth of reared species, may affect feed conversion ratios and may induce thermal stress. Warmer waters may provide opportunities to farm new species. On the other hand, higher water temperature may facilitate the spread of infectious diseases. Changes in the physical environment (e.g. storms), may increase the risk of escapes of farmed fish through equipment failure. The ClimeFish will use the European sea bass as model species while the meagre will be considered as an emerging one. With the development of models for all life stages, tied with food (quality and quantity) and temperature, we aim to understand the impact of climate change on of the target-fish species physiology, forecasting food conversion efficiency, fish growth, body size and reproduction. The Greek case study will also contribute to the project by developing scenarios for new, alternative culture areas, updating production volumes and feed demand and proposing appropriate technologies for new sites (offshore culture), as well as by developing scenarios for pathogens spread. This analysis will allow the design of management strategies, working together with stakeholders, that will address the issues considered in ClimeFish.